I woke up slowly, trying to remember what day it was. Then it came to me. “Bah! Humbug!” I declared, pulling the blankets up over my head. “Lov…get up! It’s 6 am. 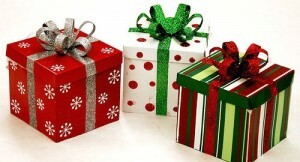 Open your presents!” my husband shouted cheerfully. I burrowed deeper under the covers. “Does that mean that this is really a civilized time of the day? Like 8 or 9?” I grumbled. “Quick, Open your presents!” they all commanded. ‘To Mom from Josh’ read the first package. And there he was, standing in front of me. Only he looked different. At that moment, I had a severe hot flash, and fell back on the coach. I peered up at her. Then I blinked, and started to walk around my house. It was…bigger. There were huge windows everywhere. I had a bathroom off the master bedroom. And a breakfast bar! “Is it self-cleaning?” I asked my husband. Then I gasped again. As I kissed my husband, I spied us both in the mirror. “Mom! Oohhhh.” cried all three children at once. And then, as I sat down contentedly I looked outside. It was different too. There were daffodils, and little red shoots on the maple trees. And then I blinked again. I was back in bed. “Is it? Is it Christmas? I murmured happily. I rolled over and pulled the blankets over my head. When you have little grandchildren, you will once again love Christmas.